Style your home with the transitional style of the DAD-413-B barstool from the CorLiving Collection. The tough cream white bonded leather seat is easy to wipe clean and a high back seat design will add comfort, support and style to your kitchen or bar. Features piping, tufted detailing, sturdy Dark Espresso stained hardwood legs and is accented with a durable chrome footrest. This well constructed barstool is the perfect way to entertain at a 38- 44 bar height, and offers great value to make the most of your indoor dining space. Add spice to any bar or kitchen island with the DAB-818-B swiveling barstool featuring a uniquely square design with padded backrest in white leatherette. It features a chrome gas lift, square chrome base and footrest. A practical and stylish choice for a smaller bar space with no-worries washable white leatherette and a shiny chrome finish that will give a sparkle to any modern setting. The gas lift offers the option to adjust the seat to varying bar heights. A great contemporary addition to any home! Add some contemporary style with these adjustable swivel barstools from CorLiving. Each barstool features a sturdy chrome plated base and built in footrest. The padded seat with high back, matching white stitching, and chrome accent adds a sophisticated look to these barstools. An upgraded gas lift ensures smooth adjustment of height and added durability. The easy-to-clean padded bonded leather seats and 360 degree swivel make these barstools the ultimate in comfort and versatility. Barstool - 2Pcs / 24 Inch H / White Saddle Seat This set of two 24 inch high barstools in a white finish is a perfect addition for kitchens, game room or for extra seating when company arrives. With a comfortable saddle seat and well positioned footrest, these classic counter height stools will be the staple of many memorable evenings with friends and family. 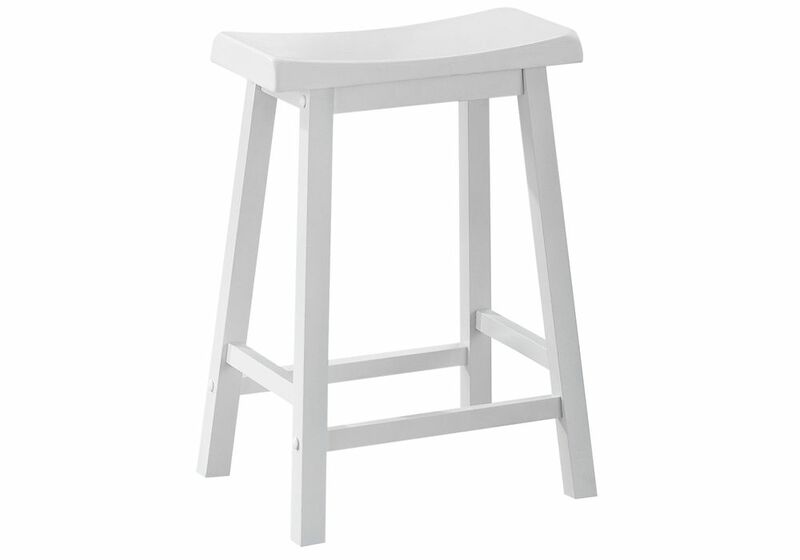 Barstool - 2Pcs / 24 Inch H / White Saddle Seat is rated 2.8 out of 5 by 6. Rated 3 out of 5 by Do it yourself from Bar stools The predrilled holes required additional drilling before screwing pieces together in order to prevent splitting the wood ..... I found this out the hard way after splitting a piece! Rated 1 out of 5 by BD from Arrived with broken pieces. We returned them. ... Arrived with broken pieces. We returned them. Rated 3 out of 5 by Nork from These are certainly not aesthetically the best product, but if you have kids and a tight budget, ... These are certainly not aesthetically the best product, but if you have kids and a tight budget, they can work because if nothing else, they are sturdy. The price for 2 was inexpensive compared to deco types. I tuck them under the breakfast bar and they present fine! Rated 5 out of 5 by mamajam from These seats went perfect with my table and they were easy to put together. These seats went perfect with my table and they were easy to put together.